The least expensive and most accessible fix is to use electrical tape. Wrap the section of frayed cable a few times with electrical tape. Firstly, this should prevent it from moving. Second, it will limit further damage to the cable. Make sure that the tape is wrapped tightly around the cut in the cable, and be sure that you’ve reconnected any wires as needed. Removing electrical tape later might completely sever the connection, which is much harder to fix than just a few frayed wires. Another cheap fix is to use the spring from a ballpoint pen. Most pens have a spring to open and close the pen from the clicker on top. The fix is simple. Take the spring and wrap it around the damaged part of the cable. You can also use this fix in combination with the one above to get a very secure fit on the tape, and to be sure the wire remains rigid. If you have game controllers, you can place the spring at the base of the controller to help hold the wire, and prevent future shorts when you wrap the wire around the controller. There might be some stretching required. In addition, use this as a preventative measure to limit damage to new cables. The next time you are shopping online, buy a few extra pens and use the springs on the cables. The final method is used for both repairs and preventing damage to cables. The technique involves using heat shrink cable. Buy some heat shrink cable when online discount shopping. 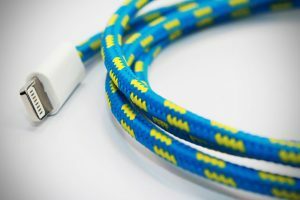 These come in various sizes to fit almost any charging cable. Please the heat shrink over the damaged area (or cable connection), use heat to shrink until it is a tight fit. Most people use a hair dryer for this part. Make sure you carefully apply your heating device, as you do not want to damage the cable, or the AC adapter you use to charge your phone. You can prevent fraying cable through proper care. Invest in some zip ties, or Velcro wraps, and wrap all your wires in a nice wide coil of wires. This prevents the wires from twisting, which can cause splitting or fraying over time. It also helps to remove wires from highly trafficked areas. Not only are wires a tripping hazard, they can become frayed or split if people walk all over them. If you absolutely need wiring in a particular place that is highly trafficked, try and lay that wiring under carpeting or a rug. Use any of these three methods and save yourself the cost of the cable and a trip to the store.